Keftedes (pr. kehf-TEH-dhes) are juicy Greek meatballs and each family has its own recipe, depending on which part of the country they come from. They are the star of every party. 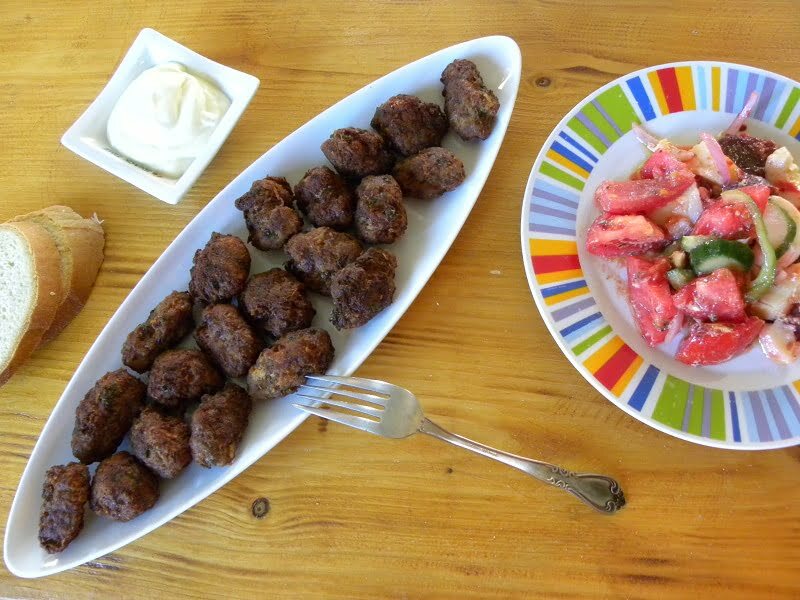 Today you will find two recipes one coming from my country, Cyprus and the others are the Greek Keftedes (meatballs). The Greek meatballs are made with stale breadcrumbs. Some prefer to soak the bread in water and others in milk. Usually ground veal is added and oregano, parsley and mint are added for flavour. Some like adding more spices, such as allspice, cinnamon or cumin and in the islands they also add either some wine vinegar or ouzo. In order to add some moisture to the keftedes, I like adding a grated tomato or a zucchini, instead of the potato which I add to the Cypriot ones. Instead of coating them only with flour, I also mix some homemade dried bread crumbs (similar to panko) mixed with flour to coat them, which gives them a nice, crunchy texture. The Greek meatballs are made with stale breadcrumbs. Some prefer to soak the bread in water and others in milk. Usually ground beef is added and oregano and mint are added for flavour. Grate the onion either on a box grated or in a food processor. Add the tomato or the vinegar if it needs some help to purée. Put all the ingredients, except the last three ones, in a bowl. Use your hands to mix well for a few minutes until the mixture is quite smooth and very well combined. Cover the bowl with the lid and refrigerate for about 1 hour. Form them into oblong patties or round meatballs, (you can use the ice cream scoop to have even-sized meatballs). Heat the olive oil in a non-stick frying pan over medium high heat or (medium if you have a strong gas stove). Use enough oil to cover almost half of the meatballs. Dredge the meatballs in the flour breadcrumb mixture, shaking off excess, then place in the skillet. Cook in 3 to 4 batches. Turn them around and cook for 5 - 6 minutes, until nicely browned all over. Drain on paper towels to absorb excess oil. The pan-frying method is the traditional way and the meatballs are slightly juicier. Alternatively, you can bake them in the oven: Spray generously with olive oil and bake at 180C/350F for 20 minutes or until browned. Add all ingredients in a food processor and mix until well combined. The Cypriot keftedes (meatballs) are always made with ground pork and grated potato and are full of flavour. Mixed pork and beef mince may also be used but personally I prefer them only with minced pork. The traditional way of making them is using only grated raw potato and of course the flavours of Cyprus which is mint and cinnamon. In the recipe which is in my cookbook, I have a secret ingredient which I learned from my sister which make them extra fluffy. The Cypriot keftedes (meatballs) are always made with ground pork and grated potato and are full of flavour. Mixed pork and beef mince may also be used but personally I prefer them only with minced pork. Grate the potatoes on a box grater and discard the excess water. Mash the other potato while warm. Add the minced meat, the onion, mint and finely chopped parsley, the eggs, salt, pepper and cinnamon. Mix very well and if there is excess fluid add some dried bread crumbs. At this stage you can put it in a zip lock bag and freeze it. Leave the mixture in the refrigerator for about half an hour or more, for the flavours to mix. Shape them into small round balls or oval patties. Heat about an inch (2½ cm) olive oil on high heat in a frying pan. Add the meatballs without adding too many and reduce heat to medium. Fry them until browned on all sides through the middle. If you like you can bake keftedes in the oven. Line a baking tin with parchment paper. Preheat the oven to 180o C / 350o F and bake them for about thirty minutes until golden on top. No need to turn them over. This and many more Cypriot recipes are included in my cookbook Mint, Cinnamon & Blossom Water, Flavours of Cyprus, Kopiaste! Serve as a main dish with pasta or Fried Potatoes the Greek Way and a Greek Salad or as an appretizer with some tzatziki or Garlicky cucumber yoghurt salad or Yoghurt Sauce (recipe below). You can find many more Greek recipes in my cookbook “More Than A Greek Salad”, and “Mint, Cinnamon & Blossom Water, Flavours of Cyprus, Kopiaste!” both available on all Amazon stores as well as through my website. Very interesting to read about adding ouzo to meatballs. I had tried a lot of things in meatballs but never that. And thank you for the Cypriot Keftedes recipe. In Greece they use NO potatoes but in Cyprus is a must. Of course there is potato in Cypriot keftedes. I recently saw a chicken version of meatballs with boiled potatoes and bread crumbs (no egg). I have still to try it myself and then decide which one to stick to.